A new species, Hyptidendron roseum, from the Chapada dos Veadeiros region, Goiás state, is described and illustrated. It can be distinguished from its congeners by the combination of inflorescences composed of a unilateral cymose structures, sessile to subsessile leaves, a ring of trichomes in the throat of the calyx tube, and a dense indumentum of white uniseriate trichomes covering much of the plant. The new species is compared with similar species such as H. unilaterale and H. albidum. New specimens of another species, H. unilaterale, formerly known only from the type, were identified in herbaria and collected in the field. Photos in vivo of this species are provided for the first time, accompanying a full description and an illustration. We assess its conservation status and comment on its distribution, ecological aspects, and identification. We thank Monique Rached for providing the illustrations; curators of the herbaria visited; Bárbara de Queiroz Carvalho Zimbres, Daniel Augusto Chaves and Gustavo Mariano Rezende for help during field work; GMA thanks CAPES, ASPT and Idea Wild for financial support and the Smithsonian Institute for the Cuatrecasas Fellowship Award which made it possible to see most of the type material of Hyptidendron species; RMH would also like to thank the staff of the Kew Herbarium, for their support; PTS thanks CNPq for financial support (grant#150217/2016-1, grant#310437/2015-6) and JFBP thanks CNPq for financial support (grant#302452/2017-1). IUCN Standards and Petitions Subcommittee. 2017. Guidelines for using the IUCN Red List categories and criteria. Version 13. Downloadable from: http://www.iucnredlist.org/documents/RedListGuidelines.pdf. Thiers, B. (continuously updated). Index herbariorum: a global directory of public herbaria and associated staff. New York Garden's Virtual Herbarium. 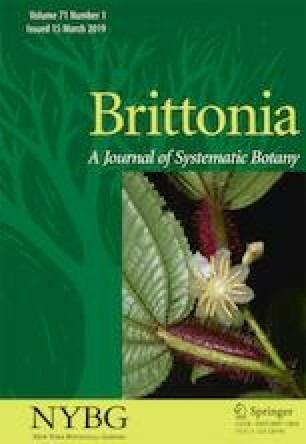 Available from: http://sweetgum.nybg.org/ih/ herbarium.php?irn=174420 (accessed: 8 May 2017).